Before we get into any details of making this transition, it is important that you fully understand each methodology. If you’ve been in sales for some time now, you’re probably quite familiar with ‘push’ tactics; and equally familiar with the average customer reaction of ‘pushing’ you away as soon as you start pitching. 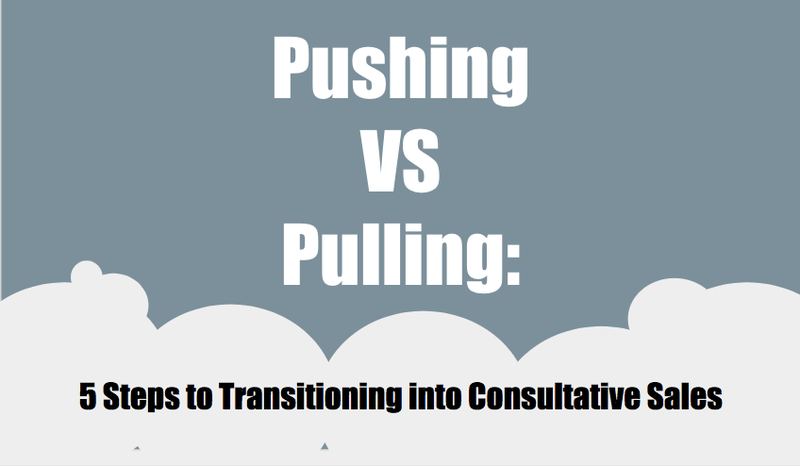 We’re going to walk you through the differences between ‘pushing’ and ‘pulling’ and discuss the enormous advantages of transitioning into consultative sales. Pushing: What Is It & Why Doesn’t It Work in Modern Social Sales? While tactics like these will inevitably still pull the impulse buyers and stragglers in, ‘pushing’ just doesn’t provide a high enough ROI to sustain a healthy business. In today’s social media rich environment, we’ve developed effective ways of cutting through the ‘noise’ of uninvited advertisement. As a society, we’re becoming less prone to take a salesman’s word for it that one blender is better than another. Consumers are looking to social media and review sites for information on product quality. They’re shopping around for a fair price. And they aren’t going to pay attention to your pitch if you can’t address their pain points. That’s where ‘pulling’ comes into play. Even if you choose to transition slowly and incorporate just a few ‘pull’ tactics into your sales game, you’re going to see dramatic results. Pulling: What Is It & Why Does It Work in Modern Social Sales? In the modern social sales environment, ‘pulling’ is considered to be the most effective manner of converting; and keeping; customers. Rather than ‘pushing’ advertorials and paid content in the faces of anyone they can possibly contact, sales professionals that use the ‘pull’ methodology focus on getting to know their target customers. Sales professionals and social media marketing professionals work together in order to produce the most relevant, evergreen content possible. This actually draws customers in and continually reminds them of how the product/service that is being offered can really make a difference in their lives. This strategy appeals to a much larger audience in modern social sales. It makes sales professionals seem much more honest, authoritative, and personable to the average buyer. Which is a huge selling point when customers can check out the competition with 1-2 clicks on their device. Many businesses are yet to make a full transition from ‘pushing’ to ‘pulling’. There’s a lot to be said for utilizing both, however. Particularly if you just aren’t comfortable leaping straight into consultative sales. What does this all have to do with consultative sales? Everything, actually. Consultative sales is the actual person to person part of the ‘pull’ sales interaction that takes place between a salesperson and their client. Using a consultative sales strategy simply means that the salesperson is asking questions to qualify the customer. This is a critical part of the whole sales process if you want to convert and retain customers. Research your market niche and make sure that you’re pitching to a relevant audience. This sounds tedious if you’re used to just sending out email and advertorial blast campaigns, but trust me, it’s worth it. Consider working with an experienced content marketer. A talented content marketer can curate existing content that is relevant to your audience’s pain points. They can also create new, evergreen content that will make you appear to be an authority in your field. This dramatically increases customer trust and marketers around the world have taken notice. Last year’s predictions for 2017 include that, “over 70% of marketers plan to create more content than they did in 2016, and over 75% will invest more in their content marketing programs”. So don’t get left behind! Interact on social media as much as possible. Your customers are watching your company for updates and/or new products or services. But it’s just as easy for them to see what your competition has to offer. So it’s important to interact with your customers and develop real, meaningful relationships. This means relationships that fulfill both your need to make a decent ROI, and their need to resolve a problem. Roughly 71% of consumers who have a good social media service experience with a brand are likely to recommend it to others (Ambassador). Consistently monitor and measure your metrics. When going through any sort of change in your sales process, it is critical that you keep track of resulting changes. Without this information, there is no way for you to accurately assess the strengths and weaknesses of your consultative social sales process; which is crippling.